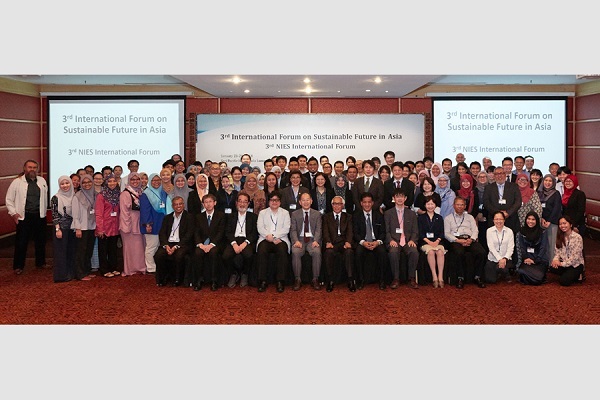 The 3rd NIES International Forum on Sustainable Future in Asia was held on January 23 - 24, 2018, in Kuala Lumpur Malaysia, as a part of collaboration between NIES with The University of Tokyo and the Asian Institute of Technology in 2016. This two (2) days annual forum invites specialists from academia, as well as central/local governments in the Asia region. This forum intends to bring together researcher from universities and government institutes, experts from government and industries with interest in discourses on sustainable development in Asia and explore the pressing environmental issues in the region, namely adaptation and mitigation, biodiversity and tropical ecosystem. It also aims to elucidate the current effort of researcher and policy makers in Asian countries, and understand the momentum in congruence with the target under SDGs and the Paris Agreement. Prof. Rizaldi Boer, in this year, attended the International Forum as one of the speaker with title of presentation “Monitoring Performance of REDD+ through the Use of Emission Risk Index”. This presentation as a part of research collaboration between CCROM SEAP and NIES Japan to support and develop the mission of Bogor Eco City.